The afflicted and needy seek water, tongue parched. I the LORD will answer Myself, I will not forsake them. 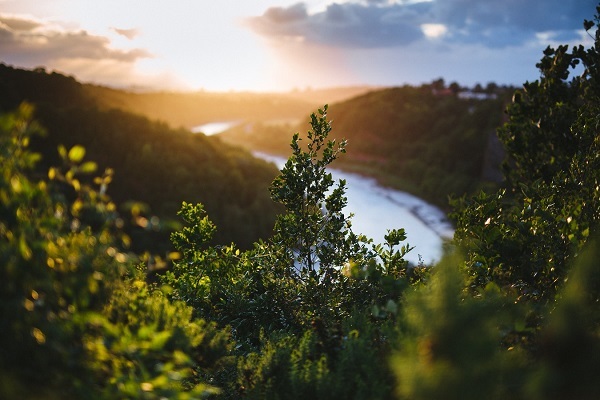 I will open rivers in heights, spring in valleys, make the wilderness a pool and dry land fountains. I will put cedar, acacia, myrtle, olive in wilderness, juniper, box tree cypress in desert, that they may see, recognize, consider and gain insight that the hand of the LORD has done this. Life is hard. I find myself telling my kids that all the time. I wish life were a bowl of cherries every day and adversity stayed at bay, but that is just not realistic. Who can identify with an adversity-free life? If you have never had an ounce of adversity, I praise God for that, I truly do; but it would be hard for me to even have coffee with you, because it would be difficult to relate. It has been said that all of us have either just been through a time of adversity, are in a time of adversity, or are getting ready to go through a time of adversity. Adversity happens— it’s life. My most recent blog posts have been wrapped around the image of the desert. The winter was long, hard and cold; and this spring has been filled with rain and dreariness for days on end. This is the kind of weather that I struggle with. 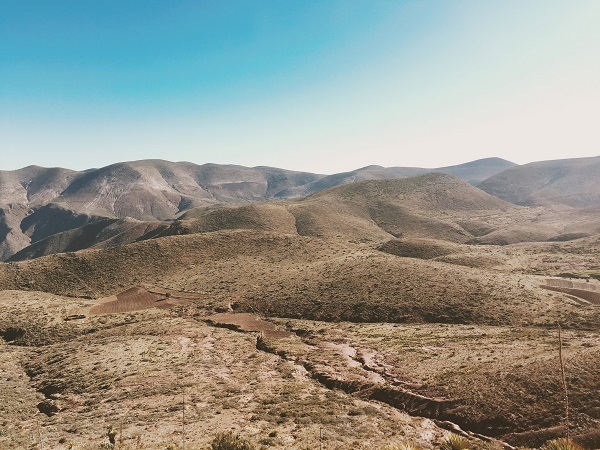 Winter and spring have been my desert in a sense—maybe more of a frozen tundra—and it has created a longing in me to return to the literal desert of Tucson, Arizona, where I grew up, so that I can dry out and thaw out. This is what led me to study actual desert habitats, to see how things survive in places where there is little or no water or food. I am so drawn to these verses in Isaiah 41; they paint such a picture of desperation. The afflicted and needy are seeking water and sustenance yet find none. When we’re afflicted and hurting, we seek to alleviate the pain. That is not a bad thing—it’s a human thing. We have needs, and we need them met. The quote, “Necessity (desperation) the mother of invention” has been attributed to Plato. We seek and we seek…we problem solve, and we collaborate, and when we finish with all that, we end up parched. We look for answers and relief where there is none to be found. We try to move, to get out and fix it all. In this world, our human ingenuity will always leave us lacking—wanting more, and never fulfilled. Awesome. This blog is truly shaping up to be an encouragement! To give us a lift, let’s consider the mountain goat: The mountain goats in the desert are amazing! These goats are sure-footed (or sure-“hooved,” I guess). 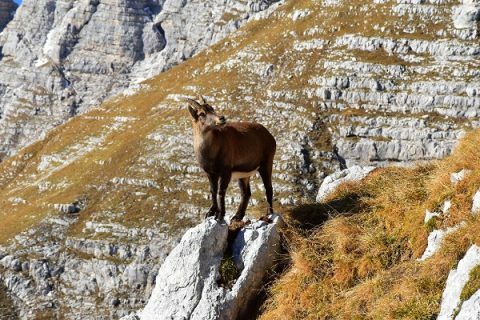 With hooves much wider and sturdier than the farm goat or countryside goats we’re used to seeing in petting zoos and on farms, a mountain goat will jump over rocks and ravines and can scale the craziest ledges. According to Encyclopedia Britannica, these goats actually prefer to sleep on steep, rocky ledges and hillsides. Who in the world would prefer to live on a rocky ledge overlooking a life-ending drop? That is crazy! 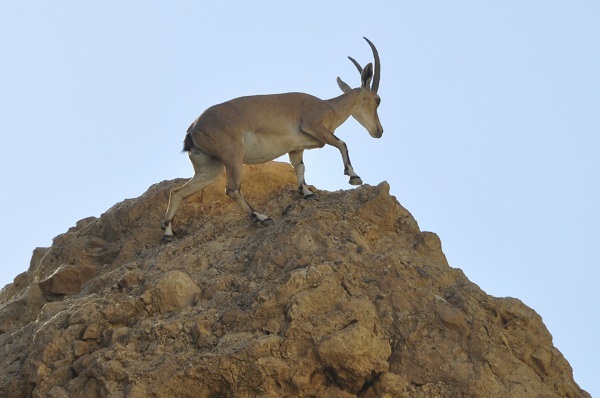 Another truly awe inspiring fact about these goats (and also about the mule deer of the desert) is that these animals can smell water beneath the surface of the desert floor to about two feet. The animals will use their hooves to dig up water that is hidden to the naked eye. 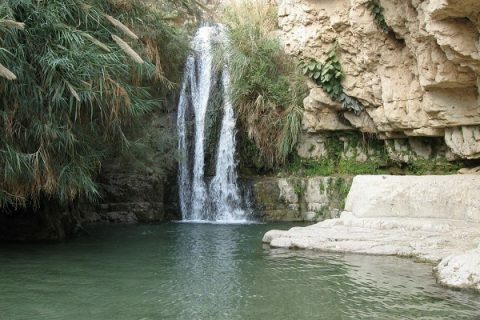 I wonder if the prophet Isaiah had En Gedi mind while he was penning those verses in Isaiah 41: a tremendous spring, situated right in the middle of the wilderness. In contrast to En Gedi, the nearby Dead Sea (also located in the desert of Judea) is so salty that no life can reside in it. The Dead Sea is… well…dead! It doesn’t really speak of “life.” Almost everything in this desert wilderness speaks of adversity, hardship and desperate need…. but then there is En Gedi. In the middle of the desert, where sojourners are faced with the very true reality of dehydration and death, there is this unexplainable, life-giving spring. 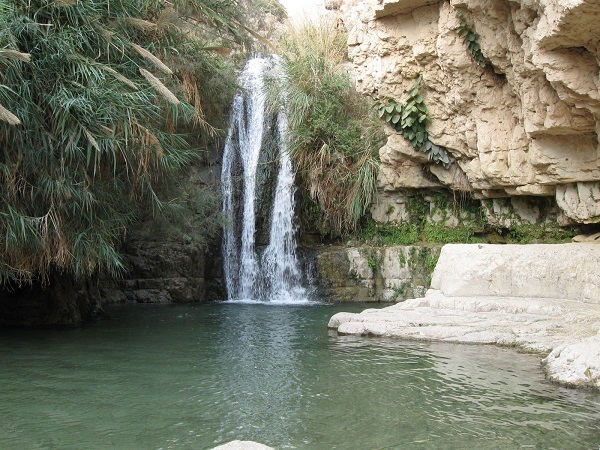 En Gedi is just that—a spring of life. Coming out of the rocks in this mountainous and difficult place is fresh water, not salt water! Bursting forth in the middle of the desert, although hidden among a difficult path, is refreshment—and not just refreshment, but shelter. There are broom trees and acacia trees that shelter and feed the goats, as well as a fresh spring easily traversed by these animals in residence. En Gedi is a literal oasis, brought forth out of nothing. Visualizing En Gedi while reading Isaiah 41 brings me such hope and confidence in the God who loves me (41:8), who chose me (41:9) and who is with me and refuses to leave me (41:10,13,14,17). I pray you will take hold of this same confidence. 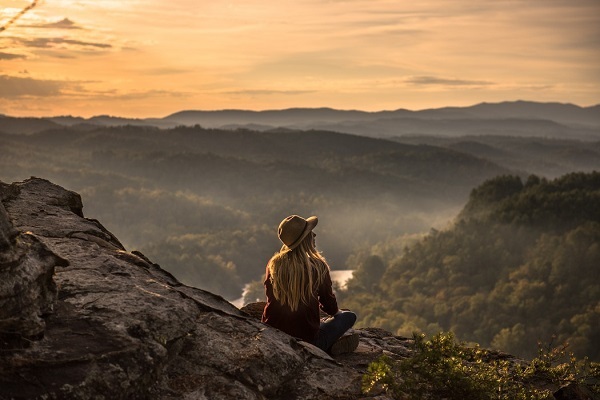 God is not ignorant of your needs nor of the fact that the mountainous path is hard, rocky, and dangerous; He has made provision for that, and that provision is Himself. God will make water flow from desert rocks and will produce shelter and food from a rocky, hard land if that is where you are. God will do what is necessary in order to provide for His people. There is nothing too difficult for God, and no person is too small to escape His eye. These verses don’t say God “may” help you, or “may eventually remember your adversity.” God says He is there, He will provide, and He will not leave you. I love when David speaks of the deer panting for water in the desert. He likens it to how he pants for God and His Word in these dry, hard and weary places. David never said that the deer wished for an easier path that was more scalable. David realized the provision God had given these mountain roamers, and he asked for the same. 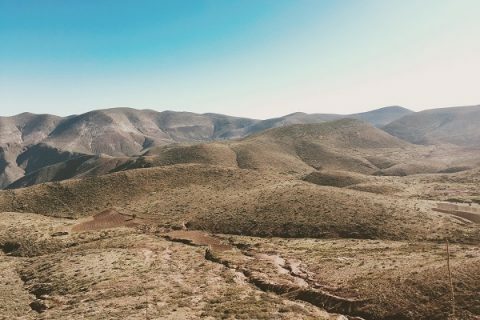 It’s easy to lose sight of God in the reality of desert adversity, but what if we really took the time to look around? Would we see a spring that came out of the rocks at just the right time? Would we discover shelter from a broom tree, (link to broom tree study) just as we were about to collapse from heat exhaustion? Would we find food from the leaves of an acacia (link to acacia study) to ease our gnawing hunger? Sure, it’s not the provision we’d prefer or the green pastures we’d hoped for, but it is a miracle of God’s provision, grace and presence nonetheless. It is because life has adversities and we are utterly desperate that we even look to God at all. Often, it is not until we have explored every avenue of self-provision that we finally call out to God and find He answers us, Himself. I love that. He doesn’t send an email through a secretary, but He answers us personally Himself. What verses of hope! What an amazing oasis in the middle of the desert! Lord, give us eyes to see and hearts to receive. When has God provided an oasis in the desert for you? What did your oasis look like? A promise to hold on to? A person who dropped by? A meal that you may or may not have even liked that provided sustenance? Have we been praying for God to change the path of adversity before us, instead of making our hooves sure-footed as we climb the terrain? Today, LORD God, give me eyes to see Your overwhelming provision, and a heart to accept it. I really look forward to your Bible studies, Kendra. God bless you! Keep up the good work! 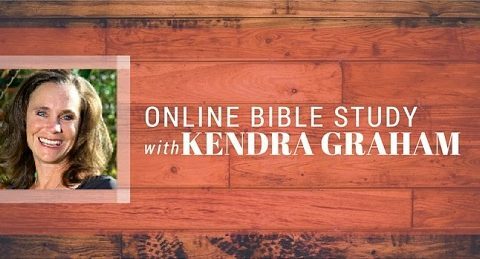 Kendra, a beautiful bible study. Well done my friend. I am so enjoying this study through the desert! It has really touched me and been a great encouragement. Thank you so much for sharing. Thank you ….I needed reminding…..
What a good word. Even if I am in the desert, looking to see God with me, will give me help and hope. Such a good teaching. Thank you! Nice article, but I was hoping for more solutions to our problems. I think we All know about the problems, but the solutions are more important than a lot of words and descriptions of the desert. The great thing we all have in common is struggle. Life is hard. Harder at some times than others. So God…. in His love came…. and gave us Himself…. because He is the answer. GOD’s Word and His promises hold. Its often not until we need God that we ever even learn His name. We need refreshing water, we thirst, so He is the living water. God’s mercy is new every morning I love how David ran to the desert in Psalm 63 because his son absolom was taking over in coup like fashion and why is David’s response with his life and the lives of his army on the line? “Oh God, You are my God; I shall seek YOU earnestly My soul thirsts for THEE my flesh yearns for THEE in a dry and weary land where there is no water. “ God meets us where we are and the answer is Him. I’m praying for you today dear John, that God’s Word and His provisos and His promises can meet those deep needs you have. Kendra, that was a fantastic blog. I have lived in Arizona almost my whole life. The desert is two things: full of flowers in the spring and heat in the fall. As we seek God in our spring times we are refreshed and strengthened, prepared for our testing and the heat of trials. like the fire of purification. God never tests us unless there’s a chance that we pass that test. If we fail a test, God strengthens us in understanding of how to refine our thinking and to choose a higher path than previous. Heaven is bright and full of light. So we must become full of light, even in times of darkness so that we are ready when we cross over to the spirit world, and can see Him as He is, Light Itself. Happiness and joy of Christ is a spiritual light that darkness cannot penetrate. God never places on our shoulders more than we can bear. May God now bring you His light and refreshment. Our brother in Christ, Billy Graham, has never stopped in his prayers and gratefulness to the Father, nor has his beloved, Ruth. Nor should we. In quiet we reflect. In noise we reject. In highs of life we rejoice, but Job rejoiced in the valleys. If we are to learn from his faith we might test our resolve in our praise of God in gratefulness for His Love for us all, even in the valleys so that no place is ever truly a valley. David proclaimed God was also in that valley with him, for God’s light penetrated the darkness. David praised God and thanked him, recalling all the past gifts, and if there was never to be another until death, it was enough to prove to David that God is the Lord of Faithfulness. If there is one gift from Heaven that we have received, one smallest of proof that God is Lord of all, and Jesus Christ is His Son, our Lord and Savior, then it is completely enough to carry us through everything we might pass through. I echo all you have stated! Thank you for this. Love this reminder and lessons about the desert. The goat is top of my list for favorite animals.